G-Watch is a program of the Ateneo School of Government (ASG), organically a unit of the Ateneo de Manila University. In 2001 and 2002, G-Watch conducted a study of 32 school districts. The study found many problems such as: about 40% of the textbooks procured could not be accounted for; the scheduling of deliveries was plagued by problems as there were no clear guidelines on when to deliver and where; the principals were not notified about the deliveries of the books; and there were no penalties for late delivery. The study found a receptive audience in the new reform minded leadership at the Department of Education (DepEd). 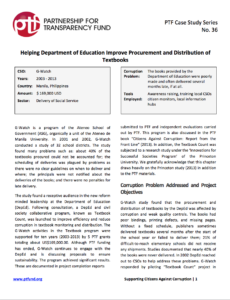 Following consultation, a DepEd and civil society collaborative program, known as Textbook Count, was launched to improve efficiency and reduce corruption in textbook monitoring and distribution. The G-Watch activities in the Textbook program were supported for ten years (2003-2013) by 5 PTF grants totaling about US$169,000.00. Although PTF funding has ended, G-Watch continues to engage with the DepEd and is discussing proposals to ensure sustainability. The program achieved significant results. These are documented in project completion reports submitted to PTF and independent evaluations carried out by PTF. This program is also discussed in the PTF book “Citizens Against Corruption: Report from the Front Line” (2013). In addition, the Textbook Count was subjected to a research study under the ‘Innovations for Successful Societies Program’ of the Princeton University. We gratefully acknowledge that this chapter draws heavily on the Princeton study (2013) in addition to the PTF materials.